If you are squeamish or a man or so far beyond periods that you think they really are the dot at the end of a sentence, skip this post. But I wanted to say a word about the Red Sea because it can be really creepy. Big flooding is sometimes part of peri-menopause. Mine happened when I went to pick daughters up at the soccer field. I got there early and was watching the tail end of practice. It was night. I was wearing jeans. And I found a grocery bag to sit on for the car ride home. That’s already TMI for many, so we’ll leave it at that. But the sea of red terrified me. I never had another episode. My friends have similar stories to tell. It goes away. If it doesn’t, check with your doctor. There are medical remedies for flooding. But the main point of this post is to say: If the Red Sea happens to you, stay calm. Soon, most likely, or at least fairly soon, you’ll be sailing on the blue seas of no periods at all. Photo: On a recent trip to Bald Head Island off the coast of North Carolina, I had fun searching for red C’s on signs and boat sterns. 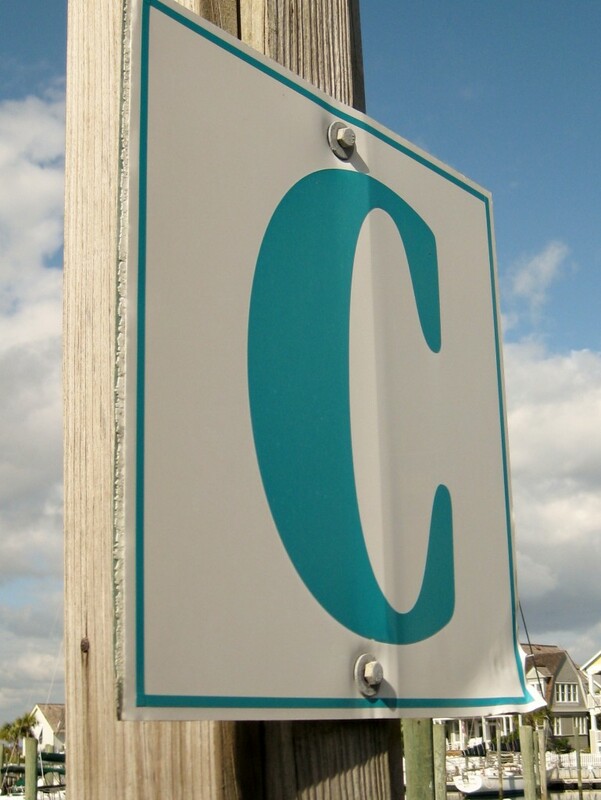 I couldn’t find any, but I found this lovely blue C on the dock in the harbor. I present it here as a symbol of beach and lake trips without periods. Score a point for menopause!